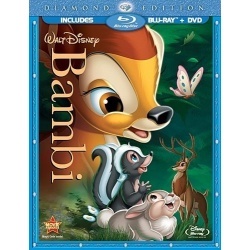 As morning light breaks across the meadow, a young deer named Bambi is born and hailed as �Prince of the Forest.� Soon Bambi emerges from the thicket on wobbly legs, much to the delight of his new friends, Thumper, the playful rabbit, and Flower, the bashful yet lovable skunk. But the fun of nibbling on fresh blossoms and frolicking through the woods is only the beginning. Exploring his new world, and guided by the wisdom of Friend Owl, Bambi learns valuable life lessons with every adventure � experiencing the power of friendship, family, and love along the away.